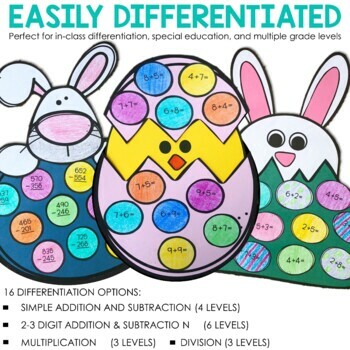 These differentiated Easter math crafts include addition, subtraction, multiplication, and division options. 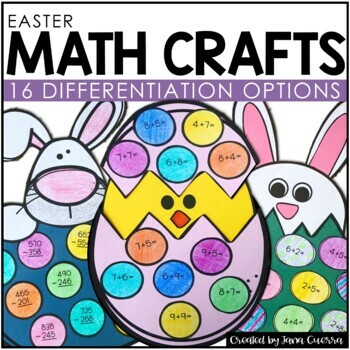 This is a special version of my monthly math crafts, and it's all about bunnies and chicks! 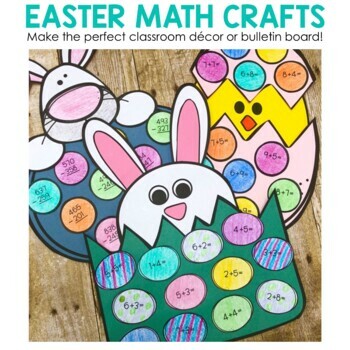 2 crafts include the traditional circles included in my regular math crafts, and one craft includes egg-shaped equations. Please see the preview for detailed information! I've also added an EDITABLE option! You can change the equations to fit the needs of your students. This makes differentiating for your students a breeze! You must have MS Powerpoint to use the editable version. • February Math Crafts: Valentines and Presidents' Day! • March Math Crafts (differentiated): St. Patrick's Day Clover and more! If you like this product, please leave feedback at my TPT store. Each time you leave feedback, you earn credits that can be used towards your future TPT purchase! Hooray! Copyright © 2019 Jana Guerra at We Heart Teaching. All rights reserved by author. Permission to copy for single classroom use only. Electronic distribution limited to single classroom use only. Not for public display.